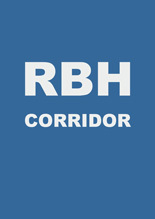 Corridors level 2, Craven Road, Reading Berkshire RG1 5AN or use south corridor entrance in Addington Road. Proceeds went to the Hospital Art and Gardens Fund. Reading Museum and Town Hall, Blagrave Street, RG1 1QH. 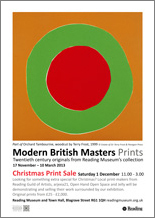 Surrounded by the Modern British Masters Prints exhibition at the Museum, this was a chance to buy original prints by local artists and see print making in action. Peacock Gallery, Maiden Erlegh School, RG6 7HS. 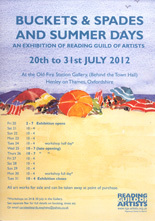 An exhibition of portraits by Guild members. Once again, members of the RGA got involved with this national event. 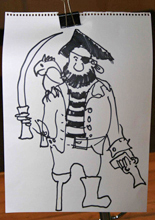 The theme this year was "pirates". 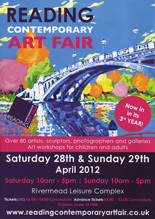 In Caversham we pitched our gazebo along with other arts-based groups down by the river in the afternoon. We formed an arc facing the performance area and soon the entertainment began. There were local rock bands, dance troupes and singers - all young and part of the “Cultural Community”. So we had plenty to sketch and plenty of potential artists – against the backdrop of St. Peter’s Church and the landscaped gardens. All ages visited our gazebo. 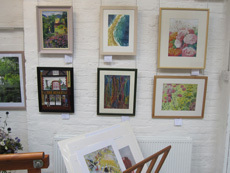 The fourteen Reading Guild of Artist members shared two exhibition stands. John Madejski opened a packed Private View. The Old Fire Station, Henley-on-Thames. 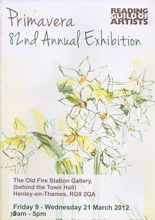 With a spring-like feel to the entries, the exhibition opened by Pam Phillips, Mayor of Henley. Two workshops were held during the exhibition, printmaking with Clare Buchta and Hilary Parkinson, and "Hand-made Books" with Joy Frey. 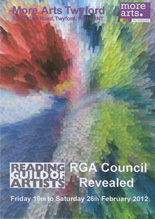 A chance for RGA members to view work produced by the Council of the Reading Guild of Artists. 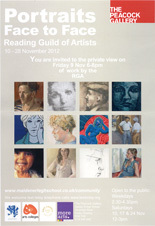 Held during the RGA Life Member "Robert Gillmor" Exhibition. 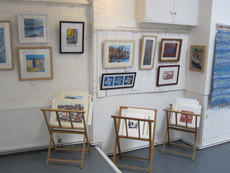 Several members contributed by running printmaking sessions, whilst other RGA members were given the opportunity to sell their own original prints. 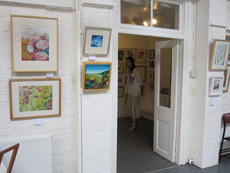 The day was very successful, with a lot of interest from the public, plus the added excitement of having RGA member Robert Gillmor, well renowned printmaker and illustrator, in the Madejski Gallery on the day.